HostGator Black Friday/Cyber Monday 2013 will start at 12:00AM Central time Friday November 29th until 11:59PM Central time Monday, December 2nd. 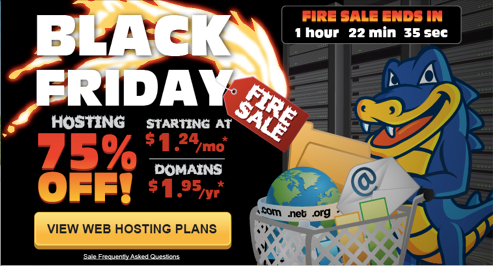 The whole Black Friday/Cyber Monday weekend will be 60% OFF Hosting (Starting at $1.98/month) and $4.50 domains. HostGator will be running limited time flash sales each day for 75% OFF Hosting (Starting at only $1.24/month) and $1.95 domains.